If you are feeling like the fertilizing, watering, and seeding routine is getting old, consider planting a ground cover for your lawn. According to the University of Illinois Extension, once ground covers are established, they need a minimum amount of maintenance. Here is a list of ground covers that can take some traffic. See also the Stepables site where you can choose from different configurations as to zone, drought resistance, and the amount of traffic. Although the site tells you which ones are deer resistant, you should still check with your local extension for verification. Last year, I planted curly thyme around my raised vegetable beds since it is low to the ground and can take moderate traffic. My garden is enclosed with an 8 foot fence. I feel much cooler when I walk on the curly thyme versus the dark mulch in my garden. Another reason I planted thyme is the flowers attract beneficial bugs. I bought my organic curly thyme bare root plants on eBay from All Season Catering in Pennsylvania. I chose All Season because the company gave a terrific price for the quantity that I needed and they were closer in proximity to my home than some of the other growers. If I recall correctly, the plants were 2 year old. I planted over 200 bare-root plants 8 inches apart. I planted over 200 plants in May. Unfortunately, more than half of them died in a month after I planted them. This was entirely my fault. Due to bad weather, I was not able to plant them right away. Strike one. Although I had them soaking in water the entire time inside the house, I think they either dried out, or I did not shade them properly as instructed the first week. Shading issue… Strike two. In addition, the weeds just took over around the plants despite the fact that I mulched around them. Strike Three. Note, if I had needed considerably less plants I would have bought potted plants instead. I think I would have lessened my chances of killing the plants because they would not have dried out. Gardeners, thoughts? The surviving plants bloom the most beautiful purplish/pink flowers. The smell is intoxicating too. I was worried that I would have a lot of bees from the flowers and I would get stung as I walked around the garden. This never happened. At the end of August, I ordered another hundred plants and clearly learned my lesson. I planted all of them in a day after I received them and put newspaper around them and hardwood mulch to keep the weeds at bay. As they grow and spread, the weeds will not be a problem. I learned my lesson about shading them in the first week, and covered them with my bent screens. My bent screens were no longer trash and became very useful. See my story about re-using my bent screens. I notice that the established plants actually flourished when they were covered with screens. Next year, I probably will cover them the month of August to shade them from the intense heat. Curly thyme is supposed to grow in full sun, so I have no idea why this matters. Any gardeners want to shed some light on this? This time I was successful and prior to the first snow, they seemed like they were all alive. Since Spring has not sprung here yet I don’t’ know if they survived the winter. Consider adding a little thyme to your life rather than your lawn! 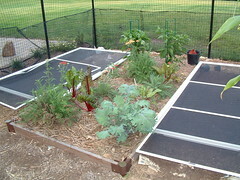 Another great article I’m currently looking into building a raised bed in my backyard, but our current problem is shade. We have lots and lots of shade from our 3 big oak trees. They’ve already choked out much of the grass so its to the books for research on what does best in shady, but hot Texas. I love the smell of thyme. I can see that you have chard growing in your garden with its gorgeous red stems. I grew it last year mixed in with blue cornflowers and it looked great. Tastes good too and it goes on forever! If you don’t believe me, count how many times you complain about something or other in one day. Whether it be being stuck in traffic, being bothered by the weather, not enough mustard on your sandwich, or whatever it is, there are endless instances where you can find a reason to complain. But it’s not just outside circumstances that we complain about. We complain about about ourselves too. We complain that we don’t have enough time, we don’t have enough money (this one is huge because it’s often “true”), that we’re not smart enough, cool enough, or just enough. Imagine how much happier you would be if you simply stopped complaining? Much of what you complain about is outside of your control anyway. What’s the point of brooding about something you have no power to change? Not very intelligent, if you ask me. Simply becoming conscious of how much you complain is the first step to stopping. When you recognize that you’re complaining, stop and take notice of it. Ask yourself if you would rather complain, or be happy.